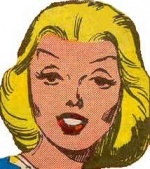 Carola is a character from the Mandrake the Magician comic strip that first appeared in "The Miss Galaxy Beauty Contest". Carola is the wife of Magnon and mother of Nardraka. 1956 Sunday "The Miss Galaxy Beauty Contest"
1958 Sunday "The Birthday Party"
This page was last edited on 1 January 2014, at 17:53.